In our last post, we began discussing the many ways semi trucks can be hazardous and cause accidents on the road. 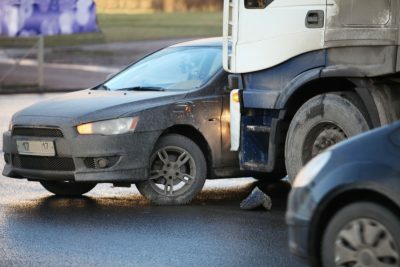 We covered why the majority of truck accidents occur, as well as what you can do to ensure that you remain safe while you are driving on the road next to semi trucks. However, what we did not cover was what happens when you are injured in a car wreck caused by a semi truck. Reimbursement for medical and hospital bills. Costs related to long-term care and rehabilitation for injuries sustained in the accident. Compensation for mental anguish, pain and suffering. Compensation for loss of enjoyment in life. Compensation from scarring and/or permanent impairment. Reimbursements for repairs on your property that was damaged in the accident. Punitive damages, which are meant to be punishment for reckless behavior and/or the disregard for the safety of other people. It is likely that you will be contacted by the trucking company’s insurance provider after the accident. Keep in mind that the claim adjuster will be trying to find any way to reduce the claim or deny it entirely. That is why it is extremely important that you do not say anything that could lead to you not getting the settlement you deserve. Your best bet is to call the experienced accident attorneys at Alex Hernandez Trial Law today. We can help you sort out this complicated situation in no time and get you the compensation you deserve.